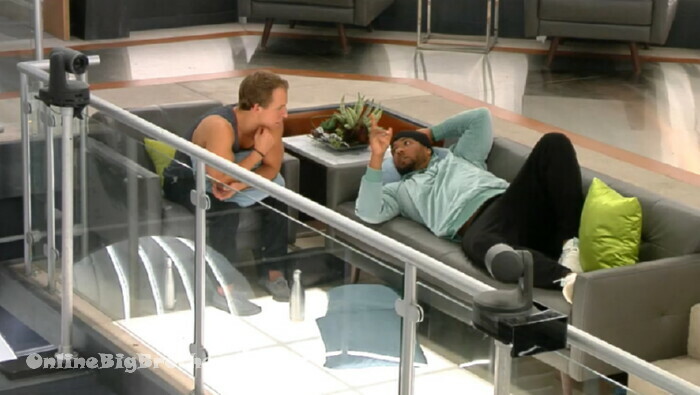 Big Brother Spoilers – Adam wins the Veto. Doesn’t smell like it’s going to be used. 10:00pm KIKI crying.. Dane comforts her. Dane – we’re going to get them out.. OK.. YOu me and Esti are going to talk tonight.. just calm down. Stef- He doesn’t do it on purpose.. I don’t think he thinks that far ahead. Kyra goes on about how people in the house have deals with multiple people. Kyra says there’s people trying to persuade them to keep mark. Sam – so you want to keep Mark now..
Of course Adam wants to keep Mark – Well Anthony keeps pressuring Adam to keep Mark. Meanwhile Anthony took every opportunity he had today to throw Dane under the bus to Adam. Anthony is running scared. He doesn’t want the Veto used in fear he will go up. But the more he talks the more lies he tells. I couldn’t believe the BullCrap spewing from Anthony’s pie hole this afternoon. He even went as far as to tell Adam he could get Sam to do whatever he wanted her to do for him. Yeah right – eye roll. Anthony is too scared to talk to Sam because of WARDEN Kyra. The Live Feeds were pretty good today. I hope Mark goes home this Week. I want Mark to stay because he will go after Adam and Sam or Dane. They all need a bit of humble pie. Inf*ckingcredible — Anthony & Adam each had one conversation with Sam & flipped her to keep Mark. ZOMG!!!!!!!!!!!!!!!! Then Sam spun what Anthony/Dane/Adam all said about backdooring Cory (something Kiki wasn’t even aware of) & somehow their cumulative complaints about Kyra got hung on Kiki who wasn’t even aware of what went down. Dane is aware Kiki is leaving (although Sam/Kyra think this will bother him – he doesn’t even care). I wonder if Dane will ask if it’s okay to vote to keep Kiki just to keep Este on his side or if he’ll vote with the boys. Man these women are such terrible players they DESERVE to be voted out in succession. BRUTAL — so much for my exciting week of drama. I’m laughing at the fact Sam/Kyra think if Este wins HOH that she’ll want to keep them safe after they f*ck her BFF over and go against the alliance they just created – RIGHT — she’ll be dying to work with them after they do that. Are you serious? I feel bad for Kiki b/c she wasn’t even in the mix today when Anthony, Dane & Kyra were all digging tunnels of deceit. Even her BFF Este screwed her over (whether she meant to or not). There is still plenty of time left this week but it sure looks like Mark will stay & hey I guess that means I have triple eviction to look forward to when he screws over his PB guys & Dane gets payback for screwing over Kiki. Kiki can thank Kyra & Sam for this entire situation too. What a disappointment this week and these female players are. i think watching the women this season being so subservient to the opinion of men has got me so annoyed that i have to take a couple days away. it’s left that entertaining manipulation place and gone to that sickly stepford vibe. i feel like the next door neighbors to the big brother house are all wondering if they should look over the fence and ask the women if they need someone to be called for help. okay. over dramatic. but really. oh my dear lord. have a thought that didn’t come from a man for just once. I get exactly where you are coming from – I kept getting angrier and angrier watching today. Kyra is so insecure it’s one thing but for Sam to do precisely what Adam wants is mind-boggling. 24 hours earlier they were dead set against voting out another girl & now they aren’t just voting her out they are championing it happening and somehow all the damage Kyra did today is falling on Kiki as if she was the one stirring up the sh(t.
i realize the edit and storyline are going for the canadian brigade / what if season three didn’t bring back sindy vibe… but omg. here’s the thing: adam and dane don’t trust anthony, but will drop everything to do what anthony says. mark hasn’t fulfilled his part of the alliance to keep a female house guest isolated and in check. okay. what makes no sense at all: kyra knows there is a men’s deal. kyra info dumps the last three days of convos on anthony. a member of the men’s deal. este knows there is a men’s deal. este goes to anthony and gives an info dump to anthony. for why???? as soon as sam nominated a woman with full knowledge there is a men’s alliance i started thinking oh i just can’t. i figure by morning adam will have said since we’re keeping mark anyway, i’m going to use the veto on him to pull him in closer and get him to owe us. put up another woman. and sam will do it. The women have been too divided from the beginning to ever band together against the four guys. They’ve come to realize that and have decided to play the cards they’ve been dealt. i honestly think what’s been triggering my anxiety / ptsd isn’t so much that the girls are playing poorly. or even that the boys are leading the girls around and the girls are perfectly willing to be led. that’s annoying. very annoying. but not enough to cause the responses i’m feeling. i think the reality is seeing things on feeds that are… troublesome. statements and attitudes that are worrying, with full knowledge that because it doesn’t match the character story the edit is trying to acheive, it’s white washed and never shown. the fact that the troublesome aspects piggyback on to the willingness of the women to give up independent thought and get along to get along is beginning to put my brain back into a place that it shouldn’t be. lol. therefore…. weening a little and possible break time.